WHAT USES DOES CLASS C1 COVER? 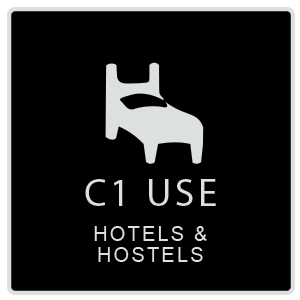 The C1 Use Class covers hotels, guest houses and boarding houses. These do not provide any significant element of care, and do not include hostels. [These come under Sui Generis.] For the use classes order, see the full list of planning use classes on the Planning Portal table. For Class C1 projects, the services we are asked for the most are interior design, 3D immersive design, and construction support services such as Tender Packs and Contract Administration. We also do Building Regulations Drawings if structural walls are to be affected in the refurbishment, and Planning Permission if the exterior is to be affected. Before you negotiate a lease or buy a property for your business, check whether you need to obtain planning permission for your intended use, and, if so, your chances of getting it. It is best to hire a planning consultant to establish this, since council planning departments tend to be limited in the time they can speak to you. We can advise you about planning permission costs. Also, they are hard to get through to on the phone sometimes, and the officers attending calls may be quite junior. At Commercial Architecture, we have worked on several hotel projects in the UK and abroad. These have mostly been high-end, luxury hotels in conservation areas, although our planning knowledge and experience also covers scenarios which are less contentious. RAMADA HOTEL, LONDON: The project brief was for 3D Visualisation, Planning application, Building Regulation drawings, Interior design, and FF&E in 20 executive suites. At Commercial Architecture, we can easily collate ideas and translate a brief into 3D visuals with our Architectural and Interior Design experience. Through mood-boards and realistic renders, we are able to provide clients with strong suggestions for the best use of internal space. This helps with the planning phase, especially if it is a challenging proposal. Our renders accurately illustrate the proposal for the planners; and they show clients how a proposal will look and fit in situ with surrounding properties and the existing building. We liaise with the client in proofing stages, achieving from the draft phase a high quality finish that meets the requirements and fits the budget. PHOENIX HOTEL, London: Commercial Architecture were approached by the Phoenix Hotel Group, who had acquired the former Travelodge Hotel, and invested in the redesign of the bedrooms to create a boutique hotel in 2013. BEAUFORT SERVICE APARTMENTS, KNIGHTSBRIDGE, LONDON: Our client was Beaufort House and they requested bespoke interior designs for their luxury service apartments. We were also instructed to project manage the build and installation of fittings for these prestigious suites. The detailed brief was firstly to make bespoke internals in keeping with the outstanding class of the local area, and secondly to exude the comforts of home, even in a short-let scenario. The majestic fabrics and stately furniture pieces were chosen to create an atmosphere of opulence for the guests. The process was completed in 4 phases over 3 years, from 2010-2013. The value of the final contract value was over £2,200,000. At Commercial Architecture, we can take on large or small projects for Class C1. Usually no project is too small for us. If you are a hotel owner and you would like a complete refurbishment or simply to refresh some of your soft furnishings, do call us so we can arrange to meet. HILTON HOTEL, DUBAI: Our client was The Hilton luxury chain for their hotel in Dubai. We did this high-end refurbishment project in 2013 to update the FF&E (movable furniture, fixtures, and unfixed equipment) in their outstanding Presidential Suites. PARK INN, LONDON HEATHROW: Our client was the prestigious Park Inn Hotel near London’s Heathrow airport. CA was responsible for specifying all fixtures, fittings and equipment, creating a thematic design for their large restaurant and lounge bar area. SELSDON PARK HOTEL: YKG were responsible for the specification of the furniture, fixtures and equipment (FF&E) in Selsdon Park hotel of conference room, waiting room, banquet room. If you would like to visit our offices, we can show you a more detailed presentation to guide you if you are interested in a class C1 hotel redesign project.